Lately I have been spending quite a bit of my time cleaning out the house of old things and trying to get everything a bit more organized. It has become an almost daily chore as boxes and items and shifted from one room to another, then perhaps back to the original room, truck loads of stuff are taken to the dump or to the local Salvation Army, while other things are packed away for the time being. I feel good to finally get rid of all the clutter after all this time but it also has taken a toll on my writing time. Sacrifices must be made and I will admit that knowing that those boxes were sitting there waiting to be dug through was a huge distraction when it came to sitting down and trying to get some writing done. So today, I threw out my plans to write another chapter and began to dig through a small pile of boxes. Most of the boxes contained a mix of various objects that were haphazardly thrown into boxes for moving purpose – obviously with the intention of being properly sorted and packed away once at the new home. Well clearly that didn’t happen until today. So among all of these strewn together items I began to find things from my childhood. Suddenly this annoying chore turned into something akin to Christmas morning. Instead of slogging through the boxes I began to gleefully open each one, wondering just what treasures I would find. In one I find an entire collection of plastic animals, ranging from tigers to elephants, to horses and everything in between. I remembered playing with those for hours on end as a kid, they were special to me then and in a way still are. So these I carefully packed away in a smaller box, properly labeling it and setting it off to the side as my hunt continued. Next to be found were a few older books, among them Black Beauty, The Black Stallion and a few other children’s books about horses. Those were tucked safely away on a nearby bookshelf. Yet after all these exciting finds the greatest of all was yet to be found. Opening up another box I was at first a bit disappointed. This one was filled with old pieces of paper, most of which got thrown out and other junk. For a moment I considered just grabbing a garbage bag and dumping the whole thing into it since clearly there was nothing good to be found. But my resolve kicked in and I continued to shift through papers until the greatest sight of all hit my eyes. I know for a fact that I audibly chirped with joy as my hands raced forward to grab this absolute gem. 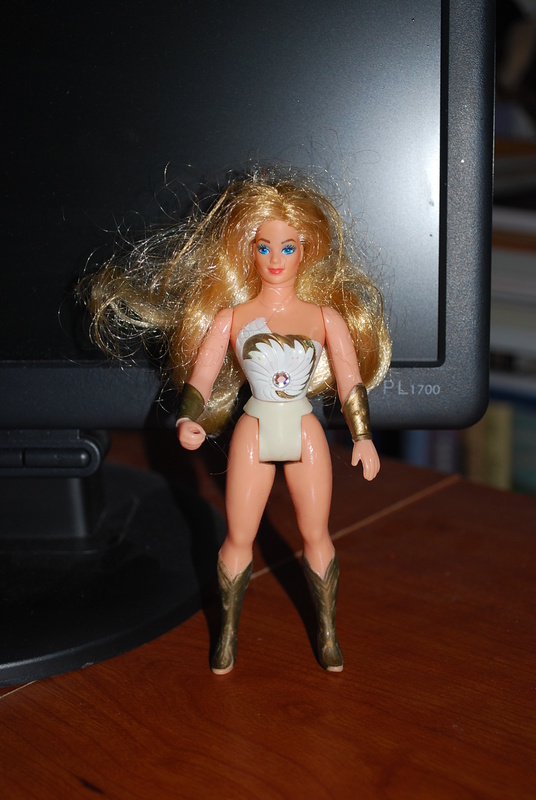 My old She-Ra doll. Ah the memories it brought back. Granted all of her accessories are still missing and I am not even sure I still have them anymore I was beyond excited to find this. A few years ago I had given several boxes of toys to my nieces and had thought this doll was among them, yet they could never find her among any of the toys. So I had considered her lost, never to be seen again. Sure he hair is a bit messy but who cares, she has spent the better part of ten years (perhaps more) stuffed away in box. And yes her breastplate is also broken but none of that truly matters to me. Let’s just say, I am a huge She-Ra fan. Always have been, always will be. I geek out at the mere mention of that series, and He-Man as well (but to a lesser extent). And to prove how much of a She-Ra fan I am I will let you in on a little secret, my cell phones ring tone is the She-Ra opening theme. 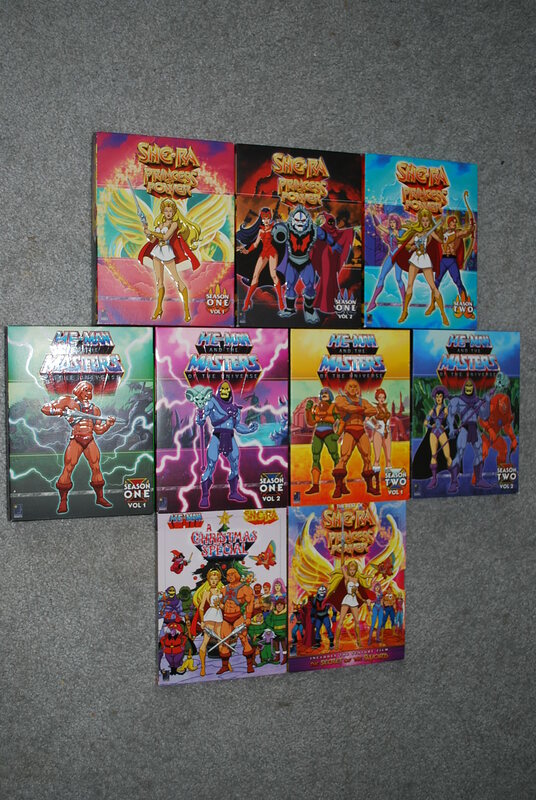 I also have all of the She-Ra episodes on DVD, as well as the He-Man series because let’s face it one needs to have all of the crossover episodes as well, the Secret of The Sword movie which introduced She-Ra and last but not least the He-Man and She-Ra Christmas Special. Now I also happen to have the updated He-Man series which was made back in 2002. I have yet to watch the full series of it, but after a few episodes I can say I appreciate their updating of the series but nothing will ever beat the original. Another DVD in my arsenal is the 1987 live action movie Masters of The Universe, starring Dolph Lundgren as He-Man. This movie is a bit on the cheesy side I will admit but honestly is a great addition to any DVD collection whether you are a He-Man fan or not. I will admit that I still hold out hope that they will make a live action She-Ra movie one day, yet at the same time fear this idea. The reason being is nowadays it seems that movies are all about the special effects and things like plot and character develop are simply overlooked in favor of bigger and better CG effects. I don’t want this to happen if they ever make She-Ra into a live action movie. I was the feel of it to be much like it was in the 1980’s cartoon. I realize that very few people would probably like it should the movie be made in such a way, but doing so any other way would simply ruin it for me and other She-Ra fans. Anyways, I’m getting off track. The point is that by digging through these old boxes of ‘junk’ I found a whole pile of treasures that I had long thought lost or forgotten about. It is great to take a few minutes about of a busy day and reminisce about the past, feel like a kid again and have joy course through your body. For now She-Ra will live on my desk resting up against the edge of my monitor while I attempt to track down all of her accessories and find a better place to keep her.